The Canon N3 shutter release trigger connector, found on higher-end Canon EOS cameras, has 3 connector pins. 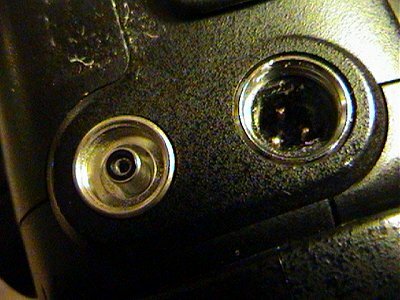 The male connector is designed onto the camera body, while the female connector is designed for shutter release trigger accessories. In the picture above, the N3 connector is the circular port on the right. The circular port on the left is a PC terminal for trigging flashes and strobes. We will save the discussion of the PC terminal for another day. What this pin-out means is that if you short the right and the top pin, the camera will focus (in AF mode). If you short the left and top pin, the shutter will release. Unlike the E3 connector (see RS60-E3 articles on this site), which is a standard 2.5mm sub-mini connector used in the audio world, the N3 connector is proprietary made by Canon. Neither the male nor the female connector can be source from anywhere. The best bet is to buy an accessory or cable adapter with these heads and cut it off for your project. Canon's RS-80n3 And how to make your own PW cable.